Retired teacher Don Domes is still active in the classroom, long after his last days at Hillsboro High School in 2014. The former career technical education teacher recently received the Tech Champion Award from the Technology Association of Oregon for his continuing work to educate children about technology. Domes is the first K-12 educator to be honored with the title. "The Tech Champion Award recognizes a leader outside the tech community who has made a powerful impact on the Oregon and Southwest Washington industry," said Skip Newberry, president and CEO at TAO. "Don has worked tirelessly on tech education in the region, delivering and finding funding for innovative programming to develop more knowledgeable, adaptable and enterprising students. His impact on our industry and in the lives and careers of thousands of students in Oregon is great. I can't think of a person more deserving of the Tech Champion award." Throughout his career, Domes has actively been involved in countless local and statewide programs including Oregon Robotics Tournament Outreach Program, the Oregon Computer Science Teachers Association, the Lemelson-MIT InvenTeam Program, Washington County Kids, TechStart, the Digital Literacy Professional Development Grant and Hillsboro School District's Outside School Time STEAM program. Domes can still be found teaching workshops like his LEGO Robotics workshop for the Oregon Science Teachers Association at their conferences throughout the year, which helps teachers prepare and educate students about technical education including engineering. Domes focused on teaching students about various technical fields, and oversaw teachers who wished to teach CTE at their own schools. He sees the tens of thousands of students graduating from high school over the years as individual opportunities to train people for local tech jobs, he said. Domes said about 30,000 jobs in industrial engineering will open up in the county within the next decade, meaning plenty of opportunity for local students to be employed for jobs currently being outsourced. "If we are preparing kids for the future, as we are preparing them, what should we be having kids get experienced in that would help them with the line of potential employment they might have?" Domes asked. "In the tech sector, there are jobs that weren't there 10 years ago, but are the students going to be prepared for where those jobs are at?" To be recognized for his work as an educator came as a surprise, Domes said. "I'm blown away," Domes said. "This could be a really good way to shed some light on how we help the next generation choose some of these areas where there a ton of jobs but we don't have a lot of qualified people." Domes said he's proud of his work to educate the next generation of tech wizards. "As technology in this society changed, I felt we needed to teach some of that," he said. "As computers came online, we needed to teach with them. We can't just keep doing the things we did. When you take a block of wood, you need to form it, shape it, and a lot of those skills are 100 percent transferable to the future, but then we need to add in things when they become available." Domes said he has constantly worked to get acquainted with new technology as it became mainstream, to be able to bring it back to the classroom. "I remember when I didn't even know what a laser cutter was," he said. "I had zero training in college. But every ten years, we needed to reinvent ourselves as teachers." 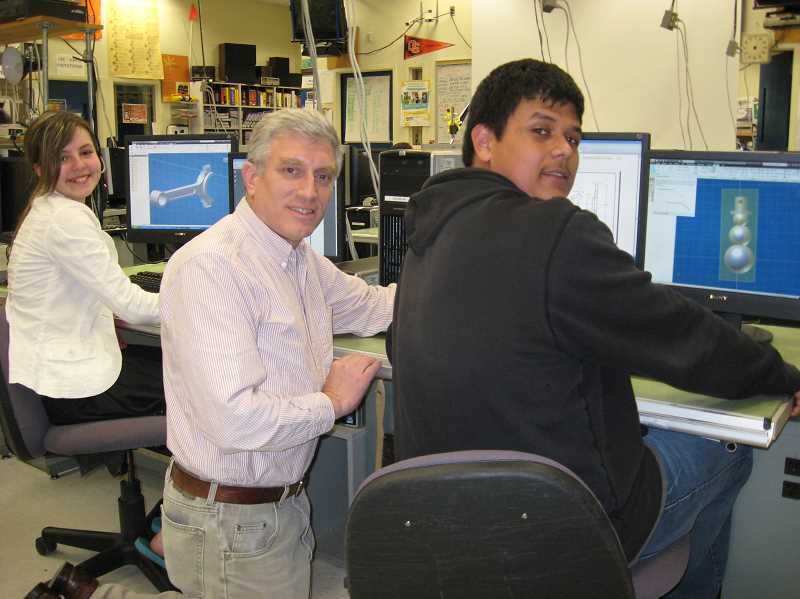 Domes, since the beginning of his career, integrated himself into fundraising and legislative efforts for CTE programs, as well as science, technology, engineering, art and mathematics opportunities for both students and teachers. Domes said in many schools, there are not enough staff with the knowledge to teach students technical skills. That's a fight he wants to continue fighting, he said. In 2012, just shy of retirement, Domes offered to fundraise half of the salary needed to employ a full-time automotive teacher after the Hillsboro School District took steps to cut the automotive program. The last program of its kind in the area, the issue gained attention from local news outlets, which wrote about Domes' work to fundraise. In the end, the funds came through and the program was saved for another year. Bill Amos, a retired teacher from St. Helens High School and a friend of Domes, said Domes has worked tirelessly to teach local children about technology. "My impression of Don from day one is, 'Here is a guy who cares about kids more than anything else,'" Amos said. "He felt like this is an area that kids need education and he gave up his summers, evenings and weekends." Domes plans to accept his Tech Champion Award in April at the Oregon Technology Awards ceremony.